Meter Luggage Loops – Pkt 100 . 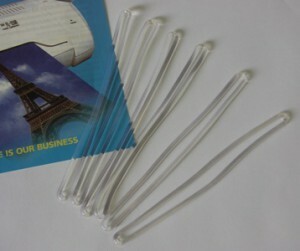 Clear Vinyl Loop that can be used as a Luggage Strap or for attaching ID Card to bag handle. Simply pass loop through slotted Laminating Pouch or ID holder and pass back through the Loop to create a slip knot. Repeat process to attach to bag / luggage.